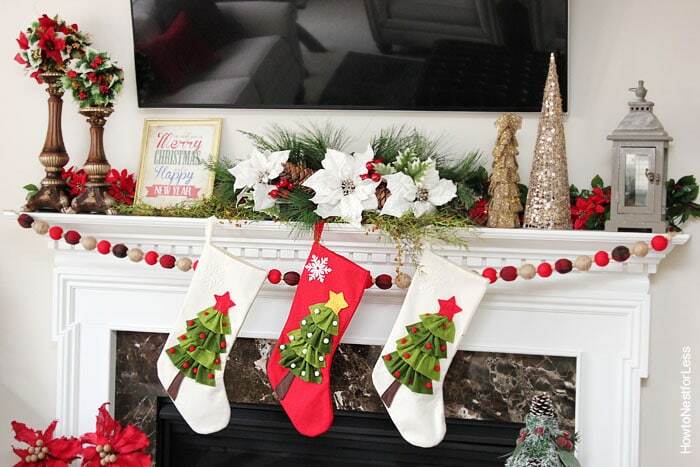 Since we moved in December of last year, I really haven’t decorated our new home for Christmas yet. 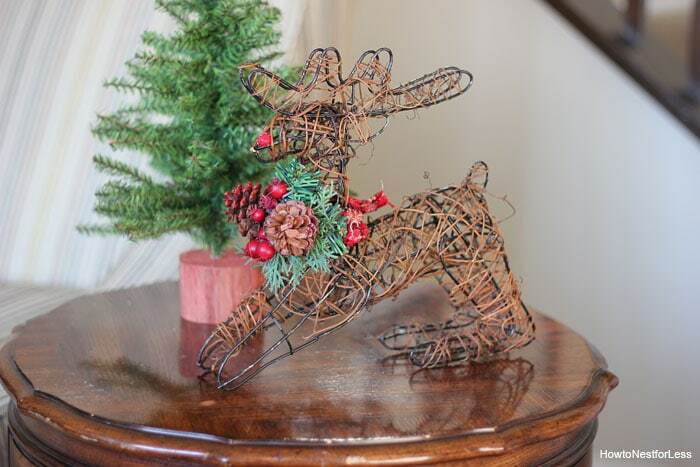 So this past weekend I dug out all of our decorations and started getting ready for the holidays. 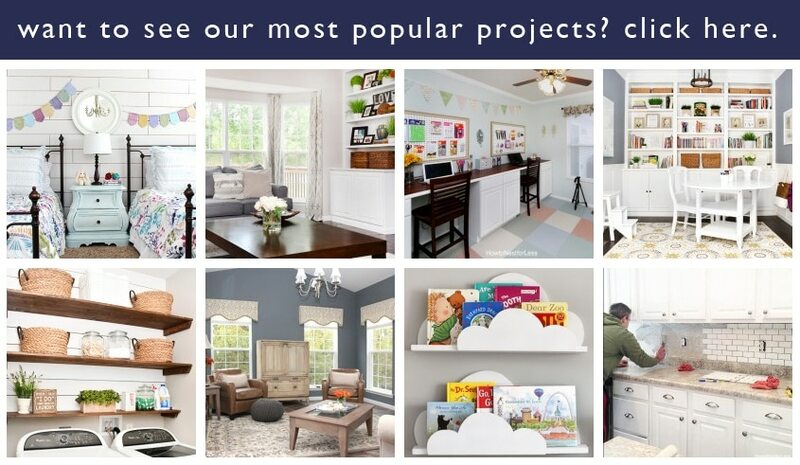 Lots of things to show you in these next few days, but today I’ll start with my favorite space… the family room. 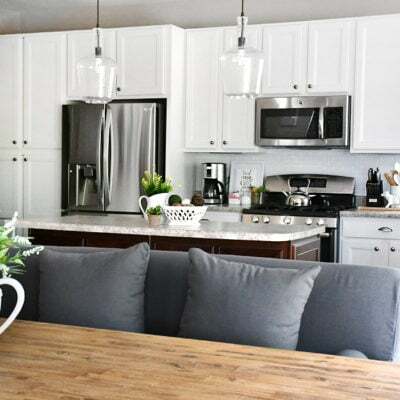 The thing I love most about this space? 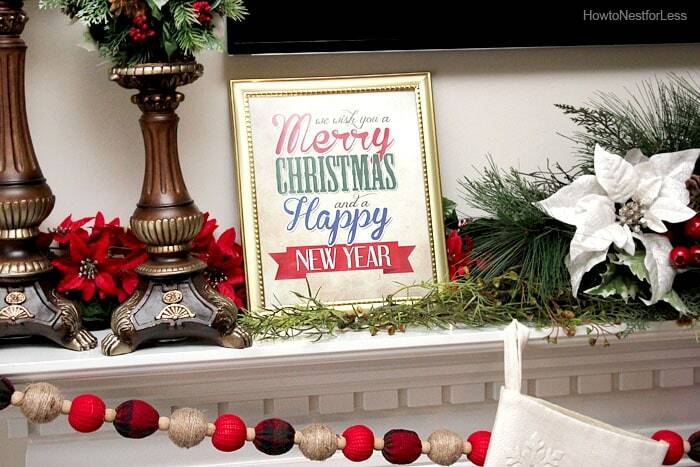 The fireplace mantel. I really didn’t buy a lot of new stuff this Christmas. 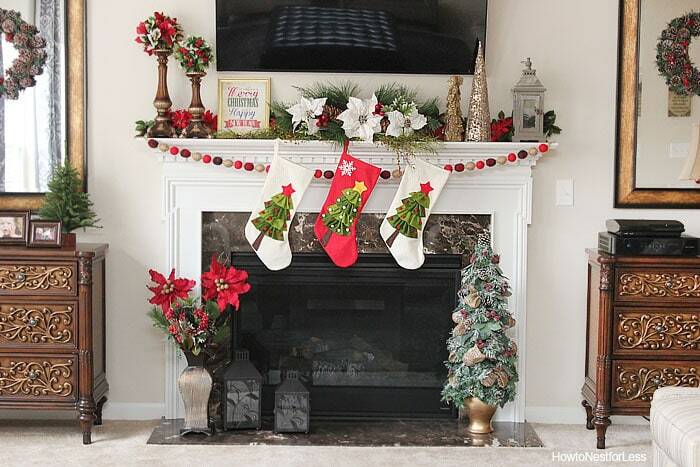 In fact, if you look at my fireplace mantel from 2012 you’ll see a bunch of the same things (although I’m still digging that poinsettia theme from the old one). 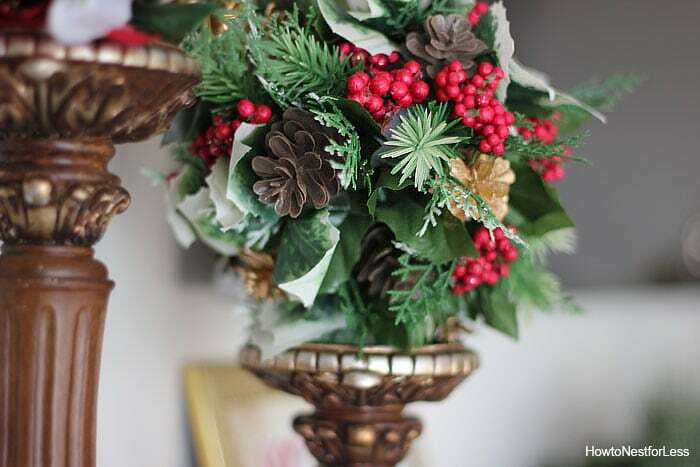 These Christmas kissing balls I put on top of some oversized candlesticks are still one of my favorites. 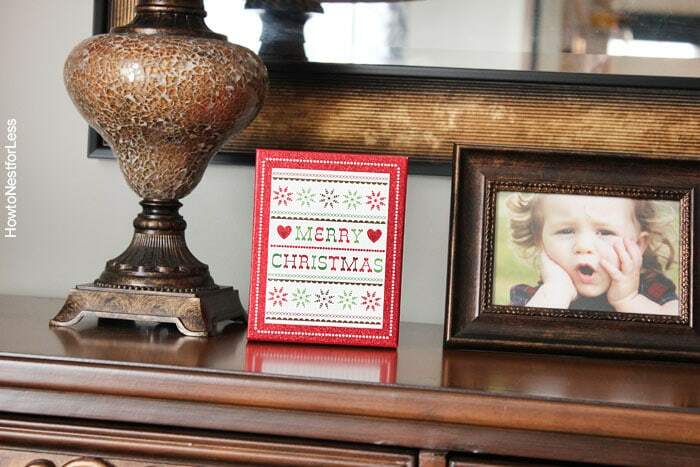 Sitting next to those I have one of my Christmas printables in a cheap gold frame. Tucked behind you can see some old poinsettia garlands I’ve had for the past couple of years and a new fabric ball garland I picked up from Lowe’s this year for $9. To keep with the gold from the picture frame I added some gold trees to the other side of the mantel. I love the texture and shimmer of these; I’ll take sequins over glitter any day. 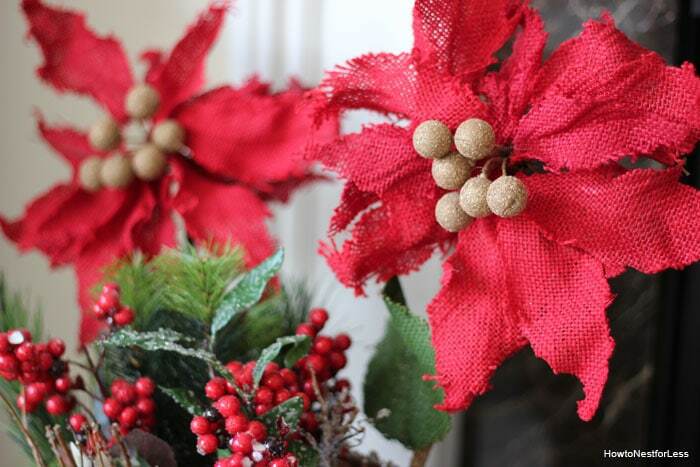 On the fireplace hearth I have a large vase filled with some cheap Christmas spray and these burlap poinsettia flowers I picked up a couple years ago from Kirkland’s. 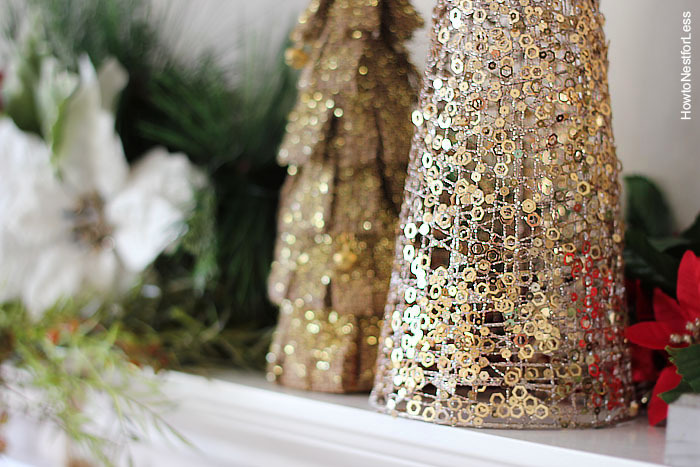 And on the other side is a mini flocked Christmas tree with lots of touches of gold and red. 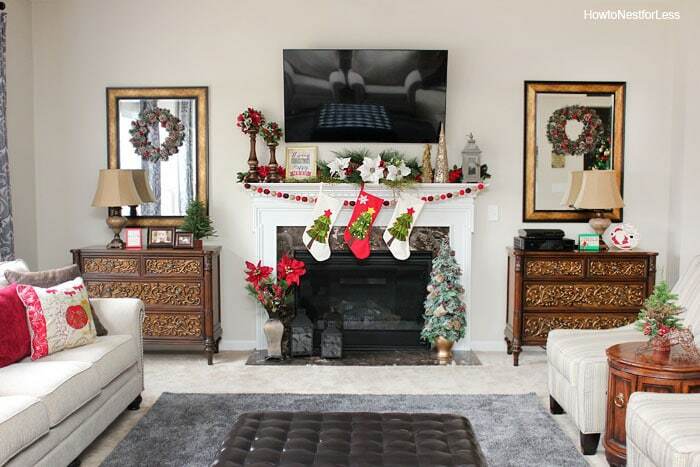 You might remember from my family room makeover that I have two large consoles flanking my fireplace. 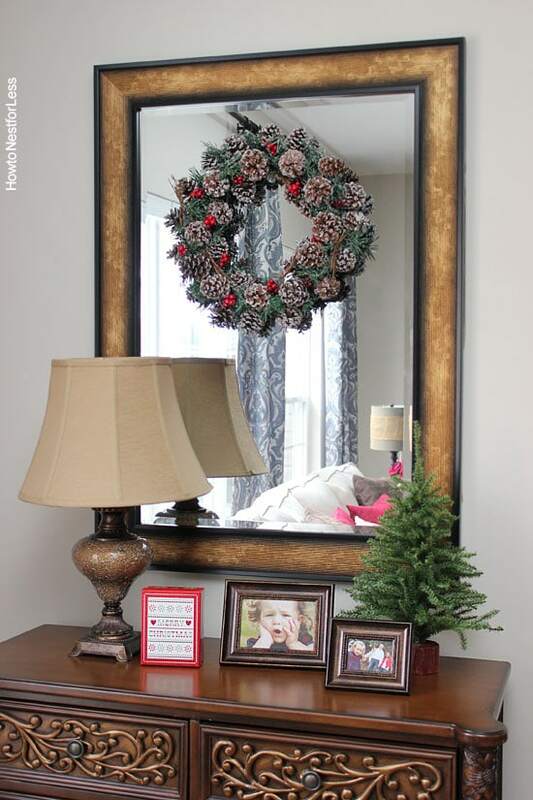 With the mirrors above I added some new wreaths from Walmart (I just attached them with Command Brand hooks). You know those little wooden box signs you can find everywhere with little sayings on them? I wanted some for Christmas but they’re kind of expensive, especially for itty bitty little things. $7-$10 each? No thanks. Instead I found some little decorative boxes from Dollar General (they had like 20 different designs). So naturally I scooped up 5 of them to place around the house. 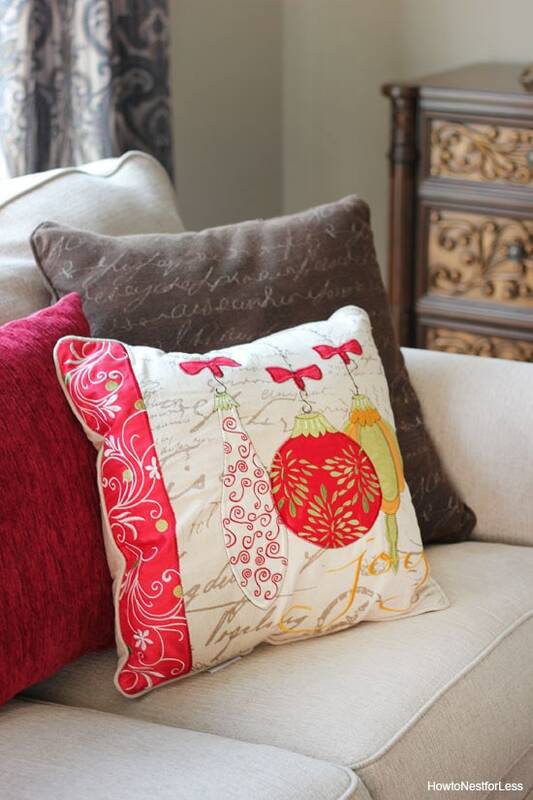 I added a little bit of color to our family room couches with some cheap red pillows from Gordman’s for $10 each and a Christmas themed pillow from HomeGoods. 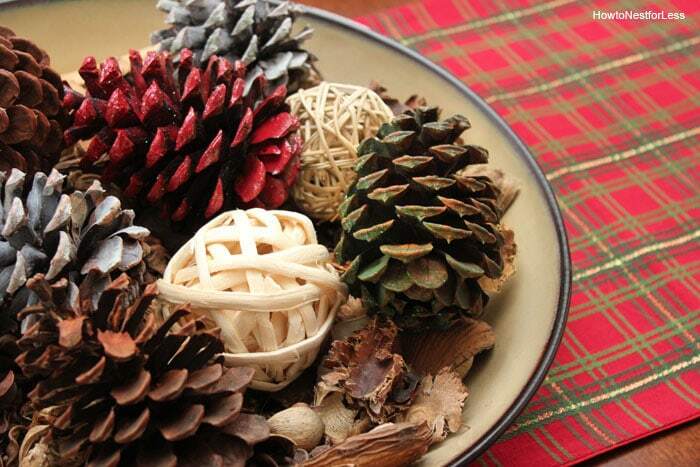 I scooped up a little bag of $4 colorful pinecones from Dollar General to put in the bowl on our sofa table. For a little bit of added color and texture I put a table runner underneath. I think I’ve had this plaid one since 2004, not even joking. 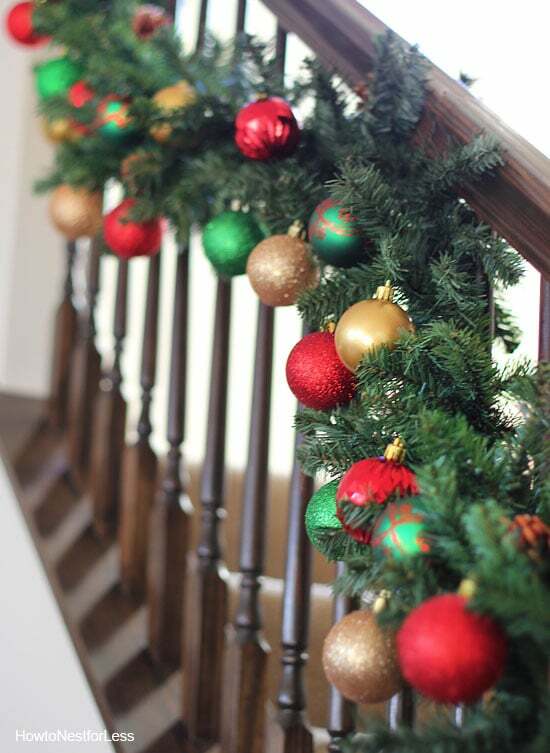 Then my newest love… my staircase garland. 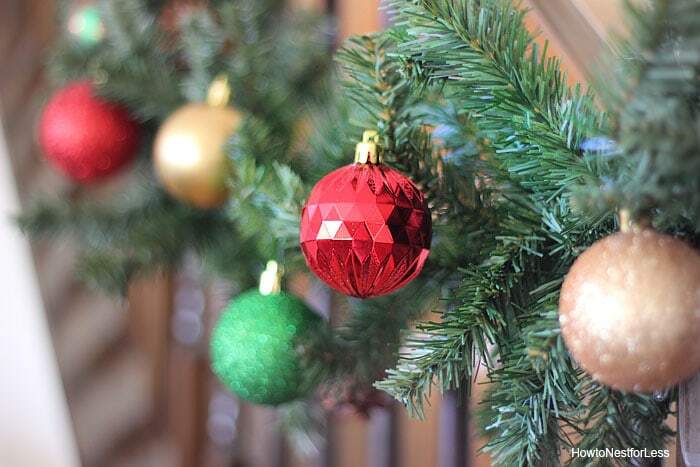 I picked up a 9ft garland on sale at Ace Hardware for $8 and covered it in cheap ornaments (you can get similar ones from Dollar General or Walmart). Basically $10 or so for a big impact. So there you have it. 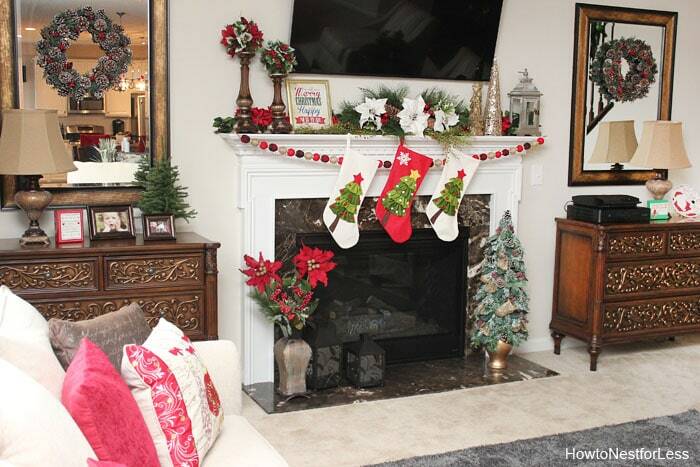 Our family room is officially ready for the holidays! 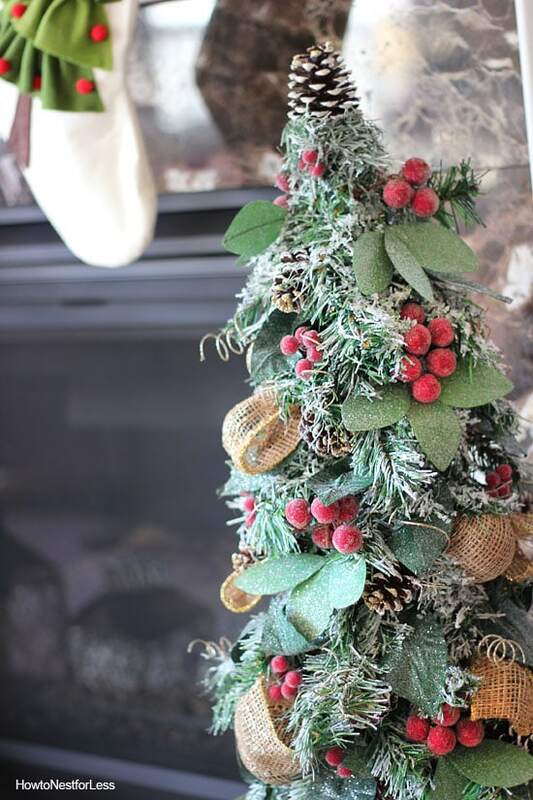 We keep our tree in the sun room so I’ll be showing you that room soon. 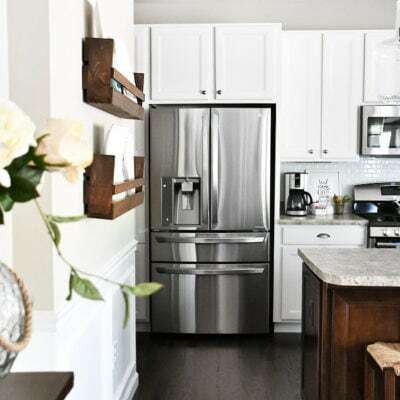 Oh, and our kitchen got a holiday makeover. Stay tuned for that one next! Thanks for the WONDERFUL ideas and printables. This is my first “trip” to Pinterest and I’m very glad I found you! I absolutely adore all of this! Your home is positively lovely! 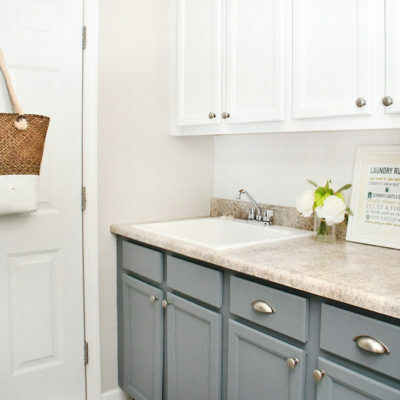 Your color scheme fits your space so well. I love how you’ve sourced the components of your decor for your followers. Thank you for sharing this.